Admission: The event is free but there is a fee to enter the park. In 2018 the Day in the Park will be held in concert with the Reach the Peak Hike-A-Thon. This free family-friendly event gives everyone a chance to learn more about the park and explore new trails and old favorites. Bring the kids and come on out and spend a Day in the Park with us on August 11, 2018. Day in the Park is an annual celebration of Lassen Volcanic National Park's birthday. Each year around August 9th we get together in the Loomis Plaza and share information, fun, food, and friends with our visitors. 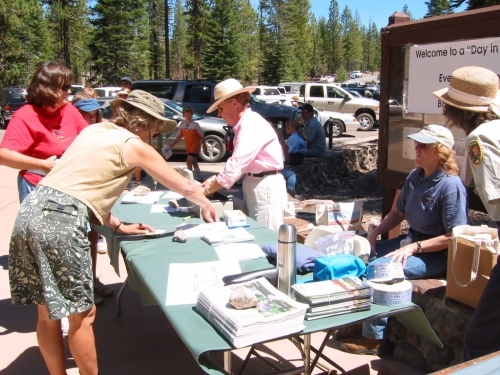 The days' event includes booths with information on park programs and services, and displays and products from the park's non-profit partners (Lassen Park Foundation and Lassen Association). Live music, face painting, and artisitic displays are also common occurances at Day in the Park. The for purchase BBQ lunch is provided with thanks to the Anderson Rotary Club. Funds raised at the BBQ benefit Lassen Park Foundation's projects and programs including the Youth Camping Program.